The mere mention of Malibu is enough to set your mind spinning. The word conjures up images of the Pacific Ocean, perfect waves, and a place so exclusive that only the pampered few can live there. It's also known as a laid-back, quiet place set in idyllic natural beauty. Most days, it feels like the Southern California you may have imagined, but without the crowds and traffic jams. Those ideas are reinforced by both the small and large screen. Gidget and Moondoggie hung out there in the iconic 1960s television show. It's also where Tony Stark's mansion sits in the Iron Man movies. Malibu is all of that (and more), but you don't need a billion-dollar net worth to enjoy it for a day or two. In fact, anyone can visit Surfrider Beach made famous in the 1960s Gidget films. You can watch whales and dolphins along the coast, explore an ancient Roman villa filled with antiquities or have lunch at an oceanside seafood shack. You may think of Malibu as a place where Richy Rich and Sally Celebrity live, but don't let that reputation fool you. You won't see this week's Hollywood Hottie shopping at the local grocery store. They have staff for that, after all. If all you do is drive through, you may not see much of the ocean either. The small town has 27 miles of beach, but along about 20 of those miles, private homes stand between the highway and the sea. And you will be driving past their garage doors and fences. Don't let all that discourage you. Just get adjusted to the ideas and then take a look at all the great things you can enjoy below. Malibu weather is best in spring and fall. The skies are clearest then, and there's little chance of rain. September through November is best for surfing, with the cleanest water and warmest water temperatures of the year. Take a Drive Along the Coast: If you've only got a day, take a drive along California Highway 1 (Pacific Coast Highway, or PCH) from Santa Monica to Zuma Beach. Visit the Getty Villa: The original Getty Museum is housed in a replica of an Italian villa and filled with antiquities. Admission is free, but reservations are required - and there is a parking fee. Check Out the Malibu Pier: It's a California icon and exceptionally pretty at sunset. You'll find a sportfishing company, a restaurant and a shop selling Malibu memorabilia. The Malibu Pier website has more information about what to do there. Go to the Beach: Malibu Lagoon and Surfrider Beach are very close to the Malibu Pier, and you can easily park in one spot and visit all three. Surfrider is one of Malibu's busiest surfing spots when the waves are high, and the lagoon is a lovely tidal wetland and also nearby is the Adamson House. If you want to have a picnic on the beach, Trancas Country Market at Highway 1 and Trancas Canyon Road is an excellent place to pick up some picnic grub. Chill Out at Paradise Cove: On an especially lovely day, you'll think this privately owned beach resort is aptly named. There's a restaurant right on the sand, and you get several hours of free parking with a minimum food purchase. It's all so relaxing that you won't even mind if the kitchen is a little slow preparing your meal. On the beach, you'll find clean sand and beach chairs for lounging. The M*A*S*H Set: Sadly, this remembrance of a classic television show was destroyed in the 2018 Woolsey Fire. See an Indian Temple: The Venkateswara Temple's classic design brings to mind some of India's prettiest places of worship. It's open to the public as long as you're respectful and remove your shoes before going in. You'll find it at 1600 Las Virgenes, and you can get more information at the Venkateswara Temple website. Depending on your interests, you may also enjoy the Weisman Museum of Art at Pepperdine University or the Adamson House, an extraordinary 1930s home filled with over-the-top Malibu tile. To see even more great architecture, the Eames House is in Pacific Palisades, just north of the Malibu city limits. Despite what it may look like in parts of the Malibu coastline, every California beach is open to the public below the high tide line. That line is easy to recognize as the highest place where the sand gets wet. Check a tide table to find out when they're lowest and you can stroll along the beach at exclusive Malibu Colony. You also need to know when high tide happens, so you don't get trapped or forced onto private property. You're going to wonder how much some of those mega-mansions cost. Add the Zillow app to your mobile device, and it will be easy to find out. In Malibu itself, you'll find only a few places to stay, and some are far lower rated than you might expect for an area with such a high-class reputation. Check availability, compare prices and read guest reviews at Tripadvisor. You can also choose a hotel on the north side of Santa Monica as your base. If you're traveling in an RV, try one of the nearby campgrounds. Geoffrey’s Malibu is a long-time local favorite restaurant, especially nice for a special occasion dinner. 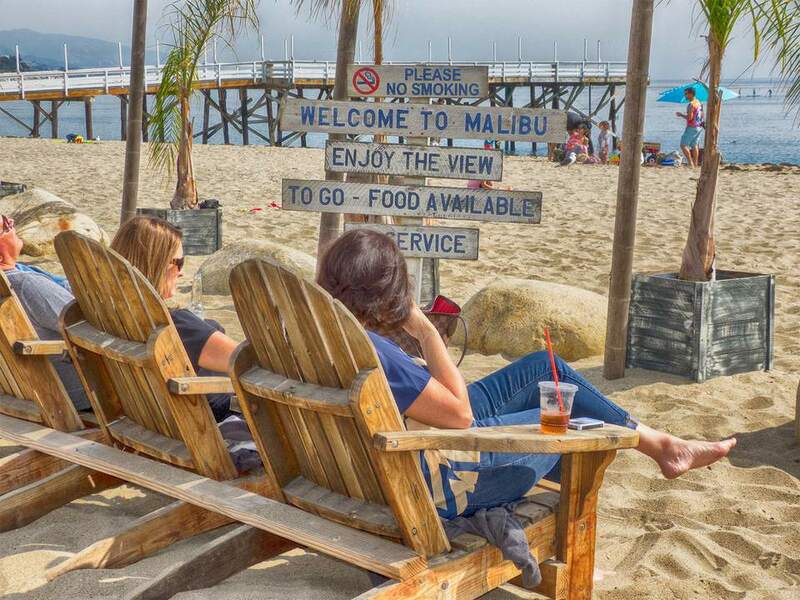 The town of Malibu has a 27-mile long coastline, but the 20-plus-mile long stretch of coastline north of the city limits is also an easy to reach part of your getaway. Downtown Malibu is 33 miles from downtown Los Angeles, 150 miles from San Diego and 127 miles from Bakersfield. The nearest airport is LAX.